Voted Ventura County’s “Best Surf Camp”! 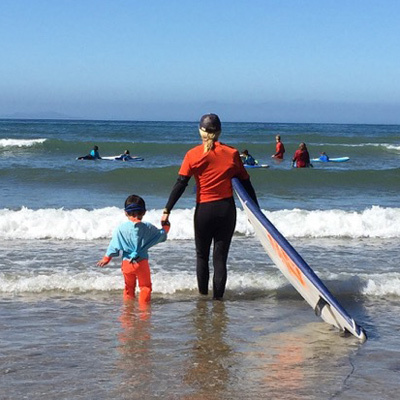 Mary Osborne Surf has been sharing the beauty of surfing to all ages since 2000. The annual Kids Summer Camps begin late June and end in August. Private camps and special classes are always available to suit your needs. All our instructors are highly qualified to ensure your child has the most efficient, fun and, most importantly, safe time out surfing. Children will learn surf etiquette, ocean safety and all the important basics to riding waves. We provide all boards, wetsuits, life vests for our “mini” campers, and can guarantee your child will have a great time. Our student ratio is 3:1 unless we have “tiny” campers who need special attention with a 1:1 ratio. All ages and parents are welcome. Pick a day, or two for your child to learn to surf this summer! Once a month, twice a month, it’s up to you! However many days you’d like, whenever it works for you. Our elite surf instruction staff try their very best to accommodate you! Is your child wanting longer periods of surf instruction? Try our 5-day sessions. Choose any 5-day block Mary is offering and watch your child take off! Are you looking for the convenience of child pick up and drop off with lunch provided? Is your child wanting longer periods of surf instruction as well? Try our Pick Up/Drop Off 5-day sessions. Choose from 2 different weeks, each a 5-day block that Mary is offering and watch your child take off! The Van Boys Charge at Mary Osborne’s 2016 Surf Camp. I just needed you to know I so love every thing about what you do. As a junior high counselor, I find it so rare to find someone who so naturally just can "speak" kids. You and your instructors are beautiful examples of confident, strong, companion, decent human beings and I love that you are out there everyday, doing the work, walking the walk. I work with "tough" kids, but I tell ya: if I have learned anything after all these years, it is this: we all just want to matter. We all (big or small) want to know we matter. All the best, Happy 4th. 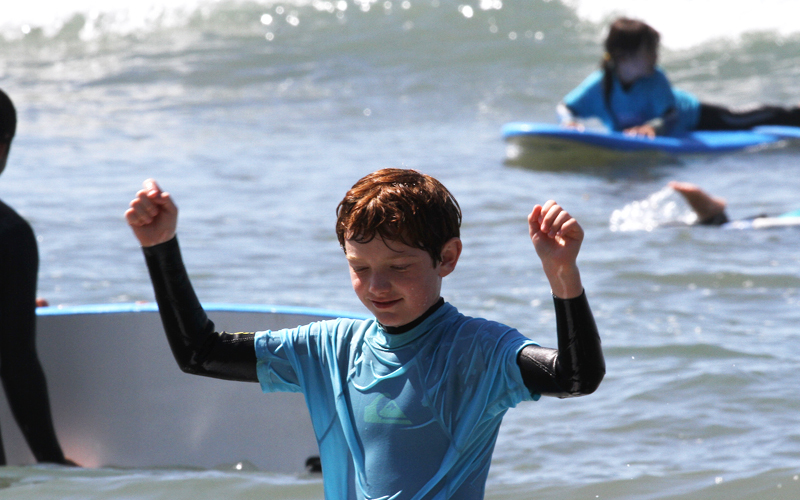 I am so impressed with Mary Osborne's surf camp for kids! It is AWESOME!! !My son is 7 and has never surfed before this week and I consider him a beginner swimmer as well. He loves it so much he is consistently the last one out of the ocean every day and doesn't stop for a snack break! Mary is an expert surfer and has a large crew of expert surfing staff so that each child gets individualized attention and instruction. They have a fun and non-intimidating approach and make everyone feel welcome. Safety is an obvious priority for Mary and her crew and I honestly have to say I never worried that my son was unsafe or surfing beyond his capability. Every surfer is encouraged to do their best. Mary and her staff are very warm and friendly and take the time to get to know each surfer and their family. Mondos beach is an excellent location for the beginning surfer as well as those with more experience. It wasn't too crowded either. Mary's friendly dog, Brick, was also a fun part of camp 🙂 I will definitely be sending my son to Mary Osborne Surf Camp again and will be recommending it to friends. I am even considering a lesson for myself! Ventura is lucky to have a pro like Mary Osborne! Mary, I wanted to let you know that your surf camp is the best we have experienced around the world!! It was conducted with professionalism, safety and fun in mind. The student instructor ratio is like nothing we have ever experienced. Both my boys have left your camp knowing how to get up in the board and read the waves. Your instruction and instructors were patient, knowledgeable and fun!! The fact that you have your own bathroom for the kids to use is another plus!!! Thank you for welcoming us and making my boys feel so special! All the best of luck and we hope to see you in the future!! My 5 year old and I did this camp together and it was AWESOME! I originally signed up my 4 and 5 year old, but my 4 year old was a little freaked out and Mary suggested we try it next summer. I asked if I could take her place and she said "of course!!" I was so excited! After having 3 kids, I was kind of worried I'd be too old, or too out of shape to learn how to surf. Her amazing, and very kind instructors had me up the first day, every day I learned something new, and I can't wait to go again, it's all I think about! As for my 5 year old he was already able to surf when we started, her instructors taught him to turn on the waves, how to catch one alone, and really taught him so much more than he already knew! Mary is extremely kind, and very good with all the kids and her instructors are the sweetest people! They keep the kids very safe and no one was ever out of sight. Being a mom I was looking all around at all the kids and was very surprised to see the surf school next to us being very unsafe. Mary's instructors keep the kids all together and have a great rhythm of having the kids surf a wave and another instructor brings them back. We are so stoked and can't wait for my other 2 kids to go Mary's surf school! Highly highly recommended!